1. The outdoors are making their way in. Achieve a seamless indoor-outdoor connection by incorporating lush greenery throughout the home—especially the bath. Bring in plants that are bathroom and shower-friendly for a spa-inspired feel like peace lilies, aloe, and snake plants. The live plant wall from MagnaFlora in the Marcia Tucker Interiors Kips Bay Decorator Show House master bathroom serves as a peaceful backdrop to the sweeping, organic lines of the Veil Trough vessel bathroom sink and rose gold accents from Kohler. If a live plant wall is beyond your budget (or your green thumb! ), take note from the master bath in the San Francisco Decorator Show Case, designed by Adele LaPointe: It features a lively touch of green by the tub—along with a mix of Kohler fixtures and faucetry, statement pendants, and nature-inspired wall coverings—that instantly transports users to the great outdoors. 2. Home bars are essential amenities. As homeowners look to entertain, bar areas have become a rising must-have—away from the hustle and mess of the kitchen where guests so often gather. 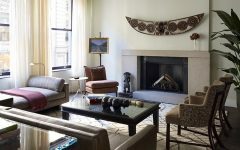 For the Kips Bay Decorator Show House, Designers B.A. Torrey and Wesley Moon created luxurious destinations that inspire visitors to linger (with a beverage in hand). Torrey’s 1970s-inspired space features bold art and lush materials while Moon opted for a more masculine aesthetic with deep Belgian Bluestone countertops and back wall to match with the KOHLER Artifacts Gentleman faucet. Readers can achieve a similar sophisticated look by incorporating refined, traditional faucets and fixtures that contrast with bold art, and dark, moody surfaces. 3. High function must meet style. The kitchen is one of the home’s most highly trafficked spaces. As such, designers are opting for open-space concepts with ample storage solutions, statement-making countertops, illuminating light fixtures, and hard-working solutions. In New York (below, right), Designer Clive Christian used the customizable Prolific stainless steel kitchen sink from Kohler for added functionality while preparing for—and entertaining—guests. And in San Francisco, Designer Ian Stallings punctuates blue-lacquered cabinetry by the Strive kitchen sink and Purist faucet for a classic touch that enhances day-to-day work in the main cooking area. Homeowners can create a similar look by selecting kitchen essentials that are at once aesthetically pleasing and useful.